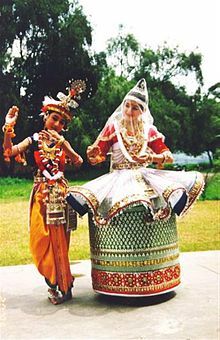 Manipuri dance is one of the seven major traditional Indian classical dance forms from Manipur, a state in north-eastern India. The dance form developed its own specific aesthetics, values, conventions and ethics. The cult of Radha and Krishna, particularly the raslila, is central to its themes but the dances, unusually, incorporate the characteristic symbols (kartal or manjira) and double-headed drum (pung or Manipuri mrdanga) of sankirtan into the visual performance. Manipuri dancing is charge with faith, the devotional fervor of bhakthi. To a Manipuri, one whole life is a dance offering. The Tandva style of men’s dancing may be swift and vigorous, the feminine Lasya an apotheosis of grace: fluid movements merging into one another with no clearly defined beginning or end, continuous as the rhythm of birth and death. One style is not more or less than the other, that’s not the point. The point is that no extraneous glance or gesture should be allowed to defile the sanctity of your offering. The ignorant call it an expressionless dance. Never! You aspire not to subtract emotion but to absorb it. The true dancer has reached a stage where the earthly audience has ceased to matter, and she is conscious of the deity in the temple of - another shrewd look – the gift of life itself. Guruji in Padma Hejmadi (1999). Room to Fly: A Transcultural Memoir. University of California Press. p. 169. ISBN 978-0-520-92145-0. Satyajit Ray in Elangbam Nilakanta Singh (1982). Aspects of Indian culture. Jawaharlal Nehru Manipur Dance Academy. p. 75. Manipuri dance is the collective name given to the dance and performance traditions that is the heritage of the Meitei people in Manipur. It has different elements in it. The classical tradition is the one associated with Rasleela, and Natpala. The folk/indigenous elements are those from Lai Haraoba. Interview with Dr Sohini Ray in "Manipuri Dance and Culture - A World Heritage". Medhajournal. 17 December 2013. Retrieved on 18 January 2014. Interview with Dr Sohini Ray in "Manipuri Dance and Culture - A World Heritage." Manipuri dance has both similarities and differences with other Indian Dances. The movements of Manipuri dances are all found in the movement system described in the Bharata’s Natyashastra. Most importantly, the music system, especially the tala system in Manipuri dance is very similar to that used in the major music systems in India with a few regional variations. As Vaishnavism came into the valley, the community accepted many of the themes and festivals that are celebrated through out India but in Manipur there was a special element added to it, dance and music. At this juncture the repertoire of classical Manipuri dance came into existence, Rasleela and Natpala began at this time. There are two major differences – the first is in the mood. Manipuri dance is very contained and controlled in its repertoire and there is no exaggeration of movements and facial expressions. Secondly, as the dance form is theatrical in origin the entire repertoire is sub-divided into two broad categories – tandava (masculine) and lasya (feminine) for the male and female characters. It is very difficult for dancers to master both techniques as they are very demanding in different ways. There are four kinds of celebration of Lai Haraoba throughout Manipur: Kanglei haraoba (celebrated in the major parts of Manipur), Moirang haraoba (as celebrated in Moirang), Chakpa haraoba (as celebrated in Chakpa and the non-Hindu Meitei villages) and Kakching haraoba (as celebrated in Kakching). Among these Kanglei haraoba is the most common form of celebration. The celebration of Lai-haraoba is done any time between April and June. It is usually celebrated communally collecting revenues from the community. The festival is dedicated to the local pre-Hindu deity of the area where it is celebrated, and is officiated by maibas (male priests), maibis (female priestesses) and the pena-khungba (the player of pena, a stringed instrument). The premiere Hindu dance tradition of Manipur is contained in the Manipuri Rasleelas, which are night-long or day-long dance dramas about the life of Krishna that are held in the temple courtyards. These are ritual occasions and are largely performed by devotees, who may not be trained dancers. There are two kinds of Rasleelas about childhood stories that enact episodes about Krishnas childhood. These are largely performed by children. There are adult Rasleelas that are held at night, these are performed by adult women, again largely devotees who perform in a Rasleela as an act of devotion. Stories from Lord Krishnas life are performed at different times of the year. The opening movements of Manipuri dance, chali... required synchronisation in movement of almost all the parts of the body — head, eye, neck, hands and legs. You keep discovering different facets of yourself as you learn more about dance. Jeena Heisnam in "Manipuris hit the road to popularise their art, tradition". Times of India. 21 December 2013. Retrieved on 17 January 2014. Manipuri dancing must be kept absolutely pure, you hear? No jerks, no wriggles. Not even the needles flutter of a single eyelash. Hand-gestures are an integral part of the form. The hand-gestures are prevalent in the older Maibi tradition as well, but they do not have any names. The later Rasleela tradition has Sanskrit names for the hand-gestures, in fact that is [the] way we were taught. Other Indian dance forms have very similar traditions of hand-gestures. Later on, in the 1970s during the peak of the political unrest Hidanmayum Thambal Sharma started a new tradition as he re-named the hand-gestures with Meitei names. I love people of Manipur and they also love … The Manipuri dance is famous throughout the world. Here women do much of the work including the outdoor work and men are relived to a great extent. By Pandit Nehru in Jawaharlal Nehru (1989). Nehru and Manipur. State Level Committee, the 40th Anniversary of India's Independence and Birth Centenary of Pandit Jawaharlal Nehru. p. 11.